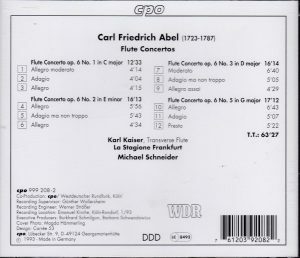 Carl-Friedrich Abel’s dates, 1723-1787, make him roughly a contemporary of the Bach sons (Wilhelm Friedemann 1710 – 1784, Carl-Philip 1714 – 1788), of Gluck (1714 – 1787), Leopold Mozart (1719 – 1787) and Haydn (1732 – 1809), and he was also a close partner in London of Johann-Christian, Johann Sebastian’s 11th son (1735 – 1782). I had much enjoyed his orchestral music (see my reviews of Abel’s Ouvertures & Sinfonias and Symphonies, Op. 10, Nos. 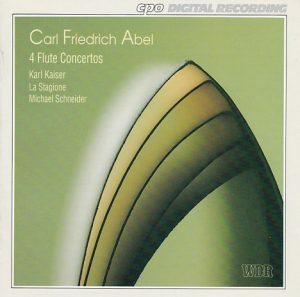 1-6), but was much disappointed with his chamber music for flute, which rarely rose above the fluffy, so I was a bit wary of these recordings of his Flute Concertos. The flute is an instrument that easily lends itself to galant fluffiness, and even Mozart didn’t entirely escape it. No cause for worry, as it turns out. There is a playfulness to the opening Allegros, a muscularity and boisterousness to the concluding ones, sometimes even true drama to either, a wistful elegance to the slow movements, a suberb funeral-mourning mood in the Adagio of op. 6-5 (track 11), imaginative and whimsical cadenzas. Stylistically, the concertos straddle a kind of middle ground between Vivaldi and Mozart. The liner notes compare them to the Flute Concertos of the Mannheim school and especially those of Franz-Xaver Richter, and though I am not familiar with them, this rings true, at least chronologically. They are not as uplifting as Vivaldi’s works, but, I find, have more emotional depth than those of Mozart. TT 63:27.